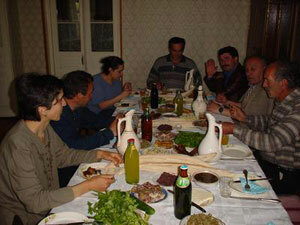 Georgians drink a lot of wine, but not every day; only if there are guests over or something is being celebrated. Women are not expected to drink very much but among men drinking is a test of your strength and manliness. Take care : strength is proved through not getting drunk or not showing that you are drunk not by passing out or ending the evening in the bathroom hanging over the toilet seat. In Georgia the tradition of toasting is very important. You only toast with wine or vodka, never with soft drinks ! The georgians only toast with beer if they wish somebody bad luck (earlier were Chevarnadze, the mafia or the police often toasted to in beer). So, to toast with beer to your guest family is not a good idea. At the short end of the feast table (keipe) sits always the Tamada, the toastmaster. The toast master is always a man and he starts the wine toasts, then everyone individually has to make a speech in return before they empty their glass in one big sip. On each evening about 10 to 15 glasses of wine per person gets consumed. If you don't want to drink to much you can try to fill the time between two toasts with long, personal and preferably emotional speeches. You will surely become very popular and the drinking speed will be slowed down, a win-win situation! The fifth toast is dedicated to dead relatives (and some wine gets spilled out on the ground for these loved and not forgotten ones). Especially during easter monday the Georgian church yards gets filled with tables, food and people enjoying a big feast in the open air, every family member give about 10 toasts to lost relatives and friends. If you feel that you have had enough during a feast evening, ask for the word and give a toast to the guest family and thank them in all possible ways. After this toast the host man will dedicate the last toast to god, an obligatory end of the evening. It is rude to blow your nose in public, especially if you do it loudly you will get strange looks. Georgians are extremely nationalistic, your love for Georgia (and then also your Georgian friends) is measured by the amount of Georgian words that you know. Language is very important in Georgia, the more Georgian you know, the better. Only prostitutes smoke on the street (!? ), it is not socially excepted for women to smoke on the street for some reason. The Georgian songs and dances is one of the most beautiful parts of the very alive Georgian tradition. Ask your guest family if they can sing Chakrulo for you, the Georgian song that in 1976 was used by NASA for the depart of Voyager as a proof of their singing talent. The best traditional Georgian chores are Rustavi and Erisioni (the " Georgian Legend", more show than Rustavi). In the Rustaveli street in Tbilisi are as well the Rustavi as the Erisioni choir located; also look out for folklore concerts in the opera and the National Ballet. The modern Georgian dance music is also not bad, very relaxing with a jazzy sound, Stepane is of the most popular musicians. In the Rustaveli street you find quite a few music shops.